Write Out Publishing, 9780996919302, 266pp. At 28, Cory Martin thought she had it all, a budding career as a writer in Hollywood, an apartment of her own, and a healthy obsession with yoga. But when she found herself on the floor of her apartment wailing into the phone, 'but I don't want to be sick, ' her entire world came crashing down. A doctor had just revealed that she had Multiple Sclerosis, a potentially debilitating disease, her good friend was getting married that weekend and the only people she wanted to call were her parents. In a time when she was supposed to be coming into her own as an adult, all she could think was who's going to want to marry me now? As she embarked on a medical quest, subjecting herself to countless MRIs and a painful spinal tap that landed her in the ER, Cory simultaneously threw herself head first into dating. But no matter how many doctors she saw or men she met there would never be a cure for MS. And if you think it's hard to get the guy you're dating to give you a ride to the airport, try getting him to drive you to the hospital. Add to that an unfortunate incident with a blue thong and a cute young doctor, and Cory quickly realized that just as there was no concrete method to diagnose and treat the disease, there was no surefire way to find "the one." 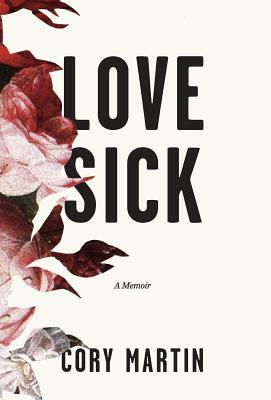 Love Sick is a smart and witty account of dating while navigating a life of uncertain health. Writing from a place of strength and vulnerability, Cory Martin faces her fears head on with humor and grace. Her tales are true to life and relatable. There is no magical ending and no grand epiphany. Instead it is her desire to be loved and feel normal that makes her journey so poignant. Many women spend their thirties trying to get settled in their careers, friendships, and love lives, Cory Martin spent hers trying to do all that while dealing with an insane medical curveball. An incredible story told with honesty, humor, and hope. - Leila Gerstein, creator Hart of Dixie, writer Gossip Girl, The O.C.